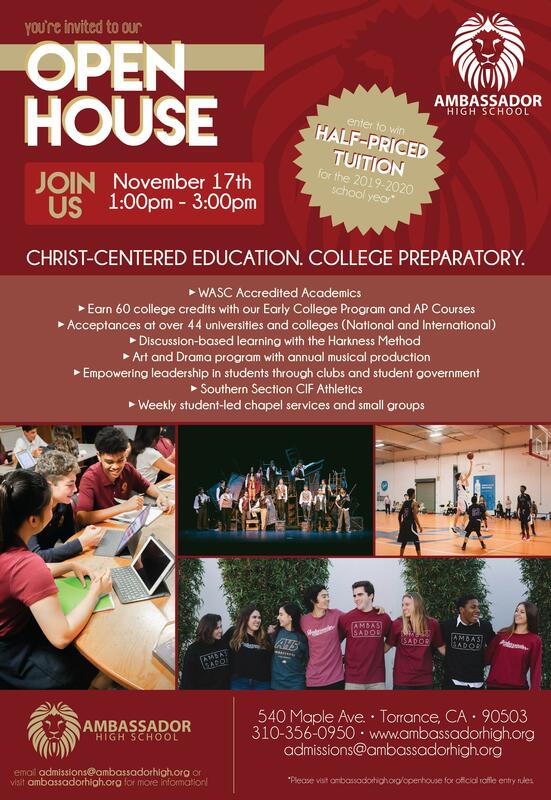 The Ambassador Family invites all students and families who are interested in learning more about Ambassador High School to attend our annual Open House on Saturday, November 17th from 1:00pm to 3:00pm (540 Maple Ave., Torrance, CA 90503). 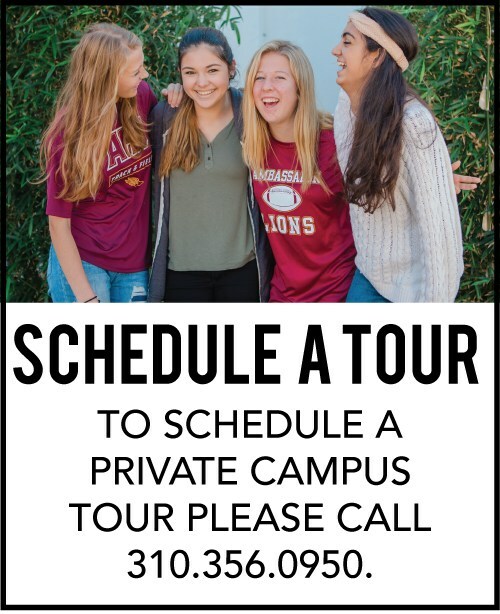 Private campus tours are available during the school day for those who cannot attend the Open House. Please contact the Admissions and Marketing Director, Mari LaBree, at admissions@ambassadorhigh.org or call 310.356.0950 to make an appointment. Ambassador students will share stories of their experience in academics, athletics, extra-curricular activities, friendships, and accomplished goals. Learn what it means to have Lion Pride! The staff and faculty at AHS are excited to meet you! They will be able to share information about our special programs, including Early College and the Harkness Method. Come prepared to meet the head of school, academic dean, teachers, athletic director, and office staff. Ambassador is located inside of the LA Galaxy Soccer Center. At the Open House you will have the opportunity to go on a student-led tour around campus to see inside the classrooms, offices, and more! Enter to Win Half-Priced Tuition! Your attendance at the Open House will allow you to enter in our Half-Priced Tuition drawing of the year! Be sure to fill out a raffle card when you check-in to enter. *Must attend the Open House on 11/17/18 to be eligible to win. Half-Priced Tuition can only be granted to new families. International students may not enter to win. Individual tours are available during the school day for those who cannot attend the Open House. Please contact the Admissions and Marketing Director, Mari LaBree, at admissions@ambassadorhigh.org or call 310.356.0950 to make an appointment.